On Tuesday this week Police Minister Bheki Cele released the South African Police Service’s crime statistics for 2017/2018. The information contained in the SAPS’ presentation detonated a small explosion beneath a claim repeatedly made, over the past month, by some of the world’s most prestigious newspapers, authoritative “Fact Checkers”, and most brilliant diplomats. How this came to pass is an interesting case study in how, in our current age, a falsity can still travel halfway around the world, and back again, long after the truth has put its boots on and kicked the damn thing to death. The story begins with a reply to a parliamentary question from Freedom Front leader Pieter Groenewald MP by the Minister of Police on the 3rd of May 2018. 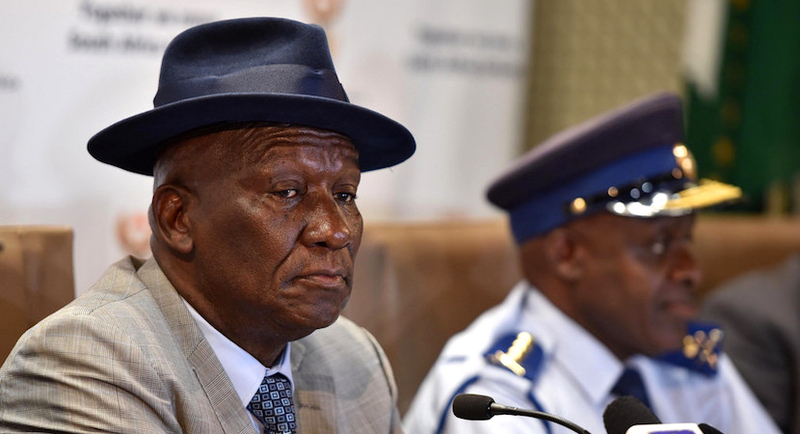 In it Bheki Cele provided detailed data from the SAPS on the provincial breakdown of farm murders and farm attacks by year from 2012/13 to 2017/18. This was useful information as it suggested that the burden of this type of crime fell disproportionally on farms and small holdings in the eastern half of the country, and that any analysis of this phenomenon needed to take this into account. The figures were not unproblematic however. The national totals for farm murders in the 2015/16 and 2016/17 periods were significantly lower than official figures earlier released by SAPS. The figure of 47 farm murders for the 1 April 2017 to 31 March 2018 period (down from 74 the year before) also seemed implausibly low. One likely explanation for this was simply that the figures had been compiled only a month after the end of the reporting year, and were not complete. As Sally de Beer of the SAPS had told Africa Check the year before “the database is a ‘live’ system, meaning that the statistics derived from it are subject to change if new information on cases emerges. The database is not primarily intended as a source of statistics, but as an operational tool.” The fact-checking site cautioned in its 2017 fact-sheet on this issue that, “As such, statistics for certain years may change.” There was thus good reason not to put any weight on this last, probably provisional, national figure. The source given for the data is clearly “SAPS” (see arrow). The person compiling the graph had merged the data provided to Pieter Groenewald at the beginning of the month with other previously released SAPS statistics. Where they conflicted – for 2015/16 and 2016/17 – Agri SA went with the significantly lower figures from May. The Agri SA report commented: “When police statistics, as announced in Parliament for the past six years, are viewed more closely, it appears that farm attacks had increased while murders declined on a year-on-year basis.” The number of “47” is contained in the graph, but not in the text of the report. 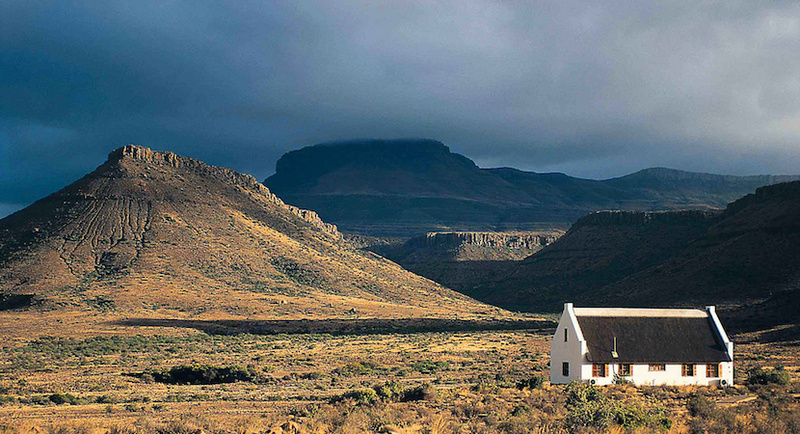 Despite Agri SA’s clear admonition to “treat farm attack statistics with caution”, News24 ran a massively hyped-up story the same day asserting that “Farm murders have decreased to their lowest level in more than 20 years, a report by agricultural organisation AgriSA has found.” It made the claim that “According to AgriSA’s statistics, farm murders decreased from 66 recorded incidents in 2016/2017 to 47 in 2017/2018. This was less than a third of the record highs recorded in the late 1990s, when 153 murders were recorded in 1997/1998.” In this way the questionable SAPS numbers released earlier that month were now magically transformed into gold standard statistics from Agri SA. AfriForum, which collects its own data on farm murders and farm attacks, also vehemently disputed this figure. The assertion that there were only 47 farm murders in 2017/18 and therefore at their “lowest level in more than 20 years”, should have been quietly buried, and left to rest in peace from then on. The opening sentence of Burke’s piece contained three factual errors. It conflated farm murders with murders of farmers (not always the same thing), cited a figure that had been already shown to be false (47), and claimed that these statistics had been compiled by Agri SA (they were from the SAPS). This zombie-like factoid – that farm murders were at a “twenty year low” – began massively replicating itself after US President Donald Trump tweeted, following a Fox News broadcast by Tucker Carlson on looming land seizures in SA, that he had “asked Secretary of State @SecPompeo to closely study the South Africa land and farm seizures and expropriations and the large scale killing of farmers.” In the subsequent rush to debunk Trump’s comments on farm murders this claim was repeatedly invoked by US and British publications, often linking back to Burke’s Guardian article as the source. It was also credulously accepted by the American and British Fact-Checking establishment. Politifact repeated the claim that “there were 47 farm murders in the 2017-18 financial year” and they “have been declining over time.” But to its (partial) credit it correctly attributed the source of this information to the SAPS, not AgriSA. None of these journalists, diplomats or Fact Checkers though it worth cautioning that the number of 47 had long been shown (by a body-count) to be too low, or even that it was contested. Although implausible to begin with – and long disproven by the time it started feasting on the brains of British and American intellectuals – this factoid was apparently too convenient not to unleash upon readers as well. It was further invested with bogus authority by simply asserting that the number came from Agri SA, rather than highly provisional police figures. News24’s hyped up interpretation of Agri SA’s somewhat more cautious analysis were also presented as reflecting the latter organisation’s own view. In a statement released yesterday Agri SA accepted the new figures, noting that “it is worrying that 62 farm murders occurred during 2017/2018. It is 15 murders more than what was announced in parliament earlier this year.” The number of 62 farm murders is down from last year’s spike of 74, but it is still above the lowest figure ever recorded by SAPS, which was 56 in 2011/12. See graph below. In other words this most recent data completely blows up what remains of the factual basis for the claim that the number of farm murders in 2017/18 in South Africa was at its “lowest point in twenty years”. 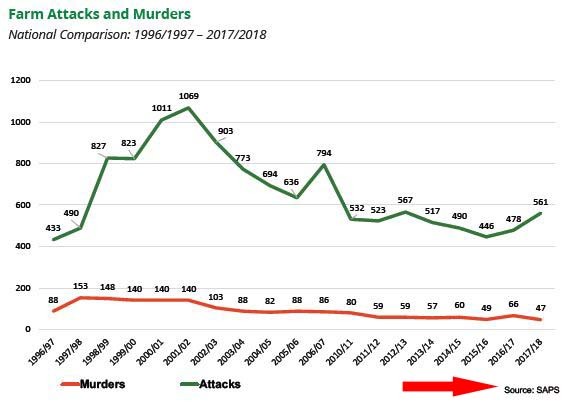 Though substantially down from its peak in the late 1990s the recent trend in terms of farm murders and more especially attacks has also clearly been upwards. Note: In interpreting the meaning of this graph above, over time, one should also tread carefully given that the number of commercial farmers has declined dramatically post-1994. Among a number of push factors has been the lack of personal security on vulnerable farms, economic factors such as the withdrawal of all state support, and government’s land redistribution and restitution programmes. There is also a three year gap in the SAPS data between 2007 and 2009. It is also not completely clear whether the pre-2007 SAPS series is fully comparable with the post-2010 one.